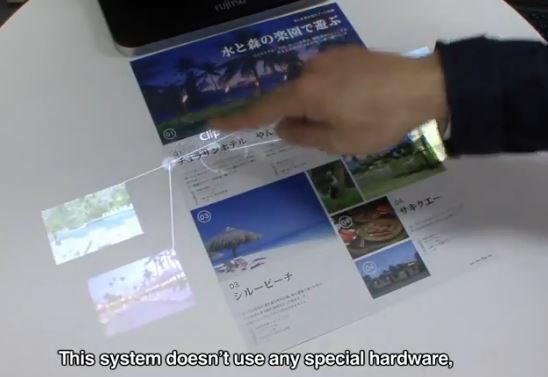 Fujitsu is making touch screen get to a whole new level by developing a software which can turn any surface into a touchscreen by introducing a new technology called Image Processing technology which doesn’t use any special hardware; it consists of just a device like an ordinary webcam, plus a commercial projector. Its capabilities are achieved by image processing technology. The Technology can be used on flat surface as well as irregular surface which helps us use this device on books as well as paper. Fujitsu says today Computer, laptop, tablets and phones are touch enabled and why not Paper. With this technology one can manipulate data on a piece of paper: by using finger gestures, you can copy an image or a text excerpt and store it into memory. This will completely revolutionize the way technology will be used in future when this technology comes out into the market. There is surely going to be technology in the near future like we have seen in Movies. With the touch Surface already developed by Microsoft, this technology brings in a different aspect to using touch screen around your house or office. Fujitsu has said that at present this technology is still in development stage and it will be fully developed by 2014.